This article was first posted on 4 May 2002 on the Usenet newsgroups rec.travel. asia and soc.culture.indian. It appears here on the Web proper for the first time. At the check-in desk, to my surprise, I am not allocated a seat number. Instead they hand me a piece of paper telling me that my seat will be ‘assigned at the gate approximately 10 to 45 minutes before departure’. I find this strange but conclude it must be a post-11 September precaution. I endure not one but two security checks and finally reach the gate. On arrival I am brusquely informed that I will be denied boarding. No arguments avail: they say another 11 passengers are in the same position. I have been overbooked. The docile functionaries of the US airline give me a hotel voucher for the night and reassign me to a flight in 26 hours’ time. I will have to fly Lufthansa to Kuwait, wait two hours and then change to a Kuwait Airlines flight for Bombay. George W. Bush’s ‘axis of evil’ speech against Iraq and Iran is still hot news: this may not be the best moment for an unplanned stopover in the Gulf. They also hand me a compensation voucher worth 750 greenbacks. I go away fuming – overbooking is one of those things you read about but never think will happen to you – and spend the best part of the day phoning, faxing and emailing to change my meticulously planned and rigorously coordinated travel arrangements. Tonight’s sleep is not exactly my best ever. Right on time at 1.05 p.m., to my immense relief, Lufthansa actually keep their word and begin to propel me into the blue heavens. The woman in the seat next to me is a medical researcher from Sweden. She too is on a lecture tour: she will be giving papers in Kuwait, Jordan and Abu Dhabi on foetal scanning, and explains that this is a subject of major interest in countries where women still routinely have ten children. As I try to imagine such a prospect in the twenty-first century, the plane heads downward and Kuwait city comes into view. It is dark, but the regular grid pattern is clearly visible. At the airport, check-in for the connecting flight proceeds smoothly. I watch men in flowing Arab dress mingle with headscarfed but unveiled female travellers. I pay for a cup of tea with a one-dollar bill. On the Kuwait Airlines plane, my fellow passengers appear to be almost entirely Indian émigrés working in the Gulf. I dine on boiled chicken and sip orange juice. This is a strictly non-alcoholic flight, of course, but I need no stimuli to fall into my first proper, undisturbed sleep since the stand-off with Delta. I wake up just before 5 a.m., Indian time, as we prepare to land in Bombay. Yes, my overstrained feet and overbooked self are finally on Indian soil. Once off the plane, I take out my cellphone, and watch as the connection surfaces. Courtesy of the BPL Mobile company, I dial home to Europe and announce my safe arrival. The sound is crystal-clear. Such instant transglobal communication was still unimaginable when I was last at this airport, a mere eleven years ago. In the meantime the airport, like the city, has changed its name, from the manageable Sahar to the abrasive-sounding Chhatrapati Shivaji International Airport Terminal II. Shivaji was a Marathi warrior not renowned for his peaceable habits, and this and other name-changes reflect the power of communalist forces here in Maharashtra state. The warm night is charged with the sultry tropical odour which I recall from eleven years ago: the typical olfactory experience of Bombay, reminding me of slightly overripe mangoes. It is far from unpleasant to breathe this in, and the moment of recognition makes me realise it is good to be back. At Immigration, I produce visa and letter of invitation and am waved through. I change a few hundred dollar bills for a thick wad of rupee notes, and am careful to ask the clerk to unstaple them. As I am a day late, I have to change my original channel plans. I have missed the Bombay-Warangal train for which I had painstakingly acquired a railpass and seat reservation at a travel agent’s in Frankfurt, the only such entity in all of mainland Europe that boasts the status of General Sales Agent for Indian Railways. If I am to get where I have to get on time, it now has to be an internal flight to Hyderabad, which will set me down just under 150 kilometres short of my destination. Fortunately there is a seat available at a little over 6000 rupees on a Jet Airways plane, departing in a couple of hours. I have to change to the national airport, but there is time. Ten minutes later, after running the gauntlet of touts and hangers-on outside the exit doors, I am safely stowed with my cases inside the airport shuttle bus. Tentative fingers of dawn light up the streets as the bus rattles its way to Chhatrapati Shivaji International Airport Terminal I, as the national airport is now confusingly called: Santa Cruz, the old Portuguese name, was much simpler. The journey takes about twenty minutes, as the two airports are the same only in name. Even at this early hour the outer-suburban streets are full to overflowing with people, auto-rickshaws and motor vehicles, but it is still too dark to take in much, always excepting the rainbow-gaudy Hindi-film posters that loom up in endless sequence by the roadside. I have to stand, but take all in my stride: I am enormously relieved just to be here. The security checks for the internal flight are harsh. They could have been worse still: a draconian notice outside at the check-in announces: ‘PASSENGERS TO REMOVE BATTERIES FROM ALL MOBILE PHONES’. I ask if this is really true: a guard tells me the rule is not being applied. This concession to leniency does not prevent them from searching my hand luggage three separate times. They confiscate a set of spare AA batteries, but, mercifully, leave my cellphone and pocket organiser untouched. After this, the flight itself comes as a welcome anticlimax. Jet Airways is a recently-created private company, but, like all Indian air carriers, is subject to strict national legislation. The in-flight leaflet tells me that alcohol and tobacco are banned on all internal flights; so are both beef and pork. I read on and discover that no hand luggage is allowed on flights originating in Kashmir. At that point I look out of the window: we have just left Bombay behind and are now overflying the Deccan plateau. The terrain is dry, rocky, all but uninhabited. I turn to the complimentary airline magazine, from which I learn that the art of paper-making came to India from China and that all four Harry Potter books are featured in this month’s best-selling English-language fiction chart. The hostess asks if I prefer ‘veg or non-veg’: I choose ‘veg’ and am rewarded with a superbly pungent mini-portion of chickpea masala and an aromatic samosa. It is almost invariably a pleasure to eat Indian food in India, and this excellent first snack is no exception. At some point we cross the state border between Maharashtra and Andhra Pradesh, and after just over an hour’s flight, we land in Hyderabad. The airport is small and easily negotiable. I phone my host in Warangal, and he suggests I book into a hotel room for a few hours and then try to arrange a car and driver to take me the rest of the way. Like that I should arrive only a few hours behind schedule, and the lectures can proceed as planned. I go to the hotel reservation desk and book into the Tulip Manohar. The hotel promptly sends a driver to the airport and in five minutes we are there. The doorman is resplendent in a turban and a bright green trouser-suit: I presume this is traditional Muslim garb, perhaps a throwback to the Raj-era court of the Nizam of Hyderabad. I am offered a special, short-stay daytime rate. It proves to be an enormously comfortable establishment, with plush armchairs that I can collapse into: here at least I can recover properly from the overbooking ordeal. In the room I discover that if I pull out the TV plug my cellphone charger will actually work: if this is the rule, I won’t have to stint on phonecalls for fear of running out of charge. In the hotel restaurant, the buffet lunch is a veritable bouquet of highly spiced dishes, and their South Indian ultra-aromatic quality comes as an added bonus. An extra-strong preparation of diced beetroot, its main ingredient contriving to look and taste remarkably like ginger, provides exactly the stimulus craved by my metabolism. A bottle of Kingfisher beer provides the perfect accompaniment: this is a Permit Hotel, and none of the other diners appear likely to object to their fellow-guest’s indulgence – which, in any case, I offset at the end with a call for ‘chai’. A satisfyingly sweet, milky pot of tea duly materialises, and as I sip I leaf through today’s copies of ‘The Hindu’ and ‘The Times of India’. The selection of newspapers runs to seven or eight, all Indian and all English-language: nothing in the local language, Telugu, and nothing either in Hindi or Urdu, the two other languages widely known in the state. I am the only foreigner in the dining-room: the lunchtime clientele, mostly families, are obviously well-heeled: all appear to be Hindu, although Hyderabad is famous for having one of the highest concentrations of Muslims in India. It is also said to be a city that combines venerable tradition with hi-tech modernity: this hotel, spotlessly clean with excellent services, is certainly no mean advertisement for the modern end. At the hotel travel desk I book a prepaid car and driver for the journey to Warangal. The driver speaks no English, but I am assured that the fare is the fare and there will be no haggling at the end. 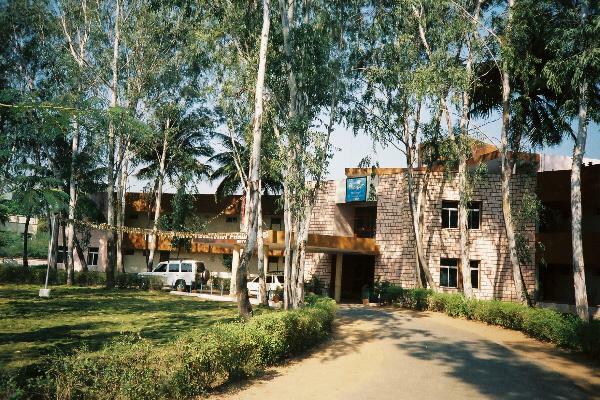 I embark in the vehicle and, fresh from the haven of the hotel, begin the discovery of Andhra Pradesh. We are almost immediately out of Hyderabad, and head north-east and on to the Warangal highway. The journey takes two and a half hours, all in a single straight line. The two sides of the road are a perfect example of ribbon development, lined almost continuously with shops, businesses and educational establishments. 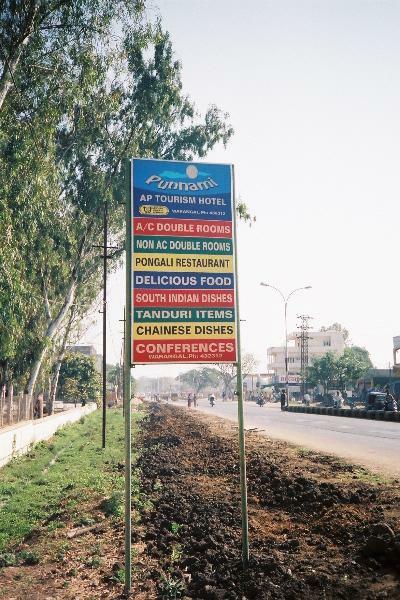 Nearly all the shopfronts have gaudily painted, bilingual signs, in English and in the cursive Telugu script. Hindi and its Devanagari script are nowhere to be seen. One evocative name follows another: ‘Hyderabad Institute of Fashion Technology’, ‘National Centre for Jute Diversification’, ‘Chakra Bar and Restaurant’, ‘Hanuman Ladies Clothing’, ‘Natty Looks Ladies Advanced Beauty Parlour’, ‘Sri Sri Divya Steel and Cement Traders’, and even ‘Krishna Wines’. Fruit-stalls display gleaming oranges, bananas, and abundant bunches of grapes. Outside a dusty shrine to Durga, a man whips a bullock; the bright-yellow goddess looks on, impassive. Cows, goats, dogs, hogs and chickens, and, at one point, a small colony of monkeys, weave their nonchalant path among the vehicles and pedestrians. In the fields, grey-black buffaloes graze as small white birds carry out pest control activities, discreetly perched on the beasts’ haunches. I seem to recall reading about this in an old National Geographic, years ago, as a textbook case of symbiosis in the animal kingdom. Finally, the car comes to a halt at the Punnami Hotel, next to the Regional Engineering College at Kazipet. My host, Dr M. Rajeshwar, is there to greet me. There is no recognition problem: we have already met in the material world, at a conference on globalisation held in Vigo (Spain) a few months earlier. I am delighted to see him, and equally pleased to register that despite everything I am only about eight hours late. 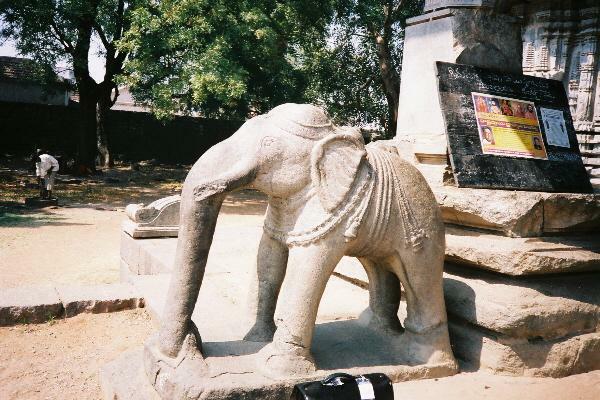 Warangal is a conurbation of 800 000 souls made up of three settlements – Kazipet, Hanamkonda and Warangal proper – strung out along the highway I arrived on, and merging indistinguishably into each other: there is no obviously identifiable town centre. My days there similarly merge one into the other, and I shall not try to separate them. Few foreigners make it to this part of Andhra Pradesh, though one of the first was also surely the most famous: Marco Polo, who, if his ‘Travels’ are to be believed, visited India as well as China, and was a guest in the Kakatiya kingdom towards the end of the thirteenth century, when Warangal was at the height of its glory as that enlightened dynasty’s capital. Today, the most likely avatar of a foreigner in these regions here is no longer a Venetian adventurer but a guest lecturer at the university. While I am here I have the company of one fellow visitor from afar, and, curiously, he too is Italian – Dr Alessandro Monti, a professor from Turin.